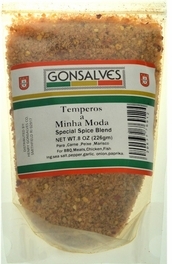 Home Local Favorites Gonsalves Temperos Minha Moda (Special Spice Blend) 8 oz. Spice mix great for beef, chicken, and pork in the continental or main land Portuguese tradition. Ingredients: sea salt, pepper, garlic, onion, paprika.